EGO: Take Off The ‘E’ and Let It GO! 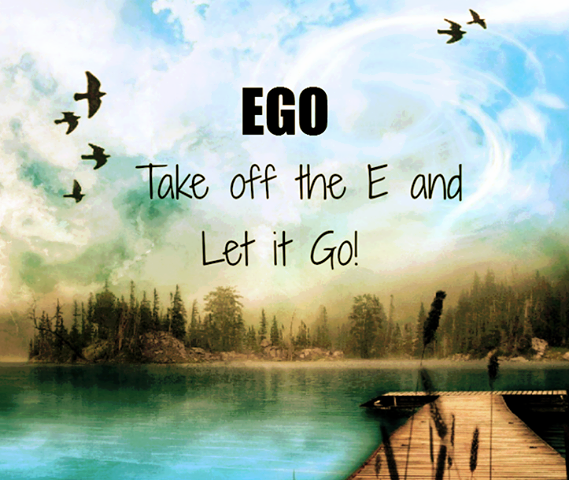 Let Go Of The Ego! This day and age is full of challenges and obstacles. They are brought to the surface in order to make room for a new beginning which will replace old patterns. The air is tense – chaotic – and we are all feeling the effects of the transition. It is unavoidable, as each and every one of us is being squeezed and squeezed like a water-filled towel. Many of us want a chance to be in the spotlight, to take center stage. In this battle of egos, we may challenge each other and attempt to show that we are better than the other. As a result, this often leads to disputes and arguments with others who have opposing views to our own. The greatest challenge is to set ego motives aside and instead, focus on contributing and providing for the greater whole. How Do I Deal With This Chaos? The first thing that must be done is to identify and set aside our ego desires. We must each let go of ego wants and desires – the wanting of more control, more spotlight, more gratification – and observe our lives from a higher state. The key is to step back, detach and take some time to breathe. The truth is, this is not a time for control or controlling, as all is in constant transition and flux. This is a good time to spend some time alone in order to relax and see things from a calmer perspective. As you spend time alone, meditating or just relaxing your mind, you can observe things from a higher state. In this way, you can choose which of the things circulating in your overwhelming world you need to prioritize and spend energy on. This will save you stress and anxiety, as you gain a greater understanding of what you need to bring more attention to, and what is not that significant at this time, and can be delayed for later on, or released entirely. As you spend time in solitude, it is important to pay close attention to the messages and signs that you receive. It is not about who hears you, but how well you listen. Rather than trying to make your voice heard to more and more people, it is first best to focus on listening to your own inner voice. Only with a peaceful mind will you be able to ‘see’ things from the viewpoint of your higher self. In this way, you may realize that some people or situations are not contributing to your highest good. Therefore, this might mean that you may need to leave certain situations or individuals. There is nothing harmful in letting go; it is all necessary in your own personal evolution. On the other hand, not letting go of things that seem toxic to you will cause you to feel suppressed and caged as a result. When ego is lost, limit is lost. You become infinite. Not a lot of people are aware of the significance of letting go to what they truly desire. Desires are the most vital part of our existence. We want – we desire – we believe we need. We are driven by our desires and often haunted by our unfulfilled longing. When you decide to release the self-perpetuating energy of wanting, that is when you can attract what you truly desire. Obsessive behavior is not beneficial to fulfilling your desires. Think of a stalker, who is obsessed with a certain individual. The more energy he/she projects, the less he/she will be able to attract the individual they desire. Instead of attracting that desired person, you are more likely to repel him/her and push them away. The feeling of want and need is perpetuated, never satisfied. The main cause of this repelling is due to vulnerability to our wanting and needing energy. Our vulnerabilities are like an open wound, exposed and unable to be healed. The more vulnerable you are, the more bacteria you attract into the wound. As a result, this does not allow our body to naturally heal itself but rather infects and deteriorates the injured parts of your being. Hence, being unconsciously vulnerable to your individual wants and desires acts in the same way as the open wound analogy. In other words, the more emphasis you put on what you want desperately to obtain, the less likely you will be to obtain what you desire. After all, desperation projects a mentality of lack and scarcity, which sends out signals to the Universe that you cannot achieve your heart’s desires. Once you release the energy of needing and wanting, sometimes that is precisely the moment when you actually gain that something. Relax, step back. Breathe. Meditate and clear your mind. Lower the tempo of your desires and wants. Receive inner peace and guidance. Excellent post! My blog reading time is limited and I would read this one again. Very helpful! ” It’s not about who hears you, but how well you listen” Thank you – I needed to see that in print.